I’m all for making yourself comfortable on your commute home. I understand after a long day you just want to relax and let it all hang out. Under the right circumstances I’ll condone putting your bags on the seat next to you, sleeping on the bus, putting your feet up, whatever you need to do to ease the tension after a long day. What I don’t condone, however, is people who take their shoes off on public transportation, or in any other indoor public place you’re not meant to for that matter. 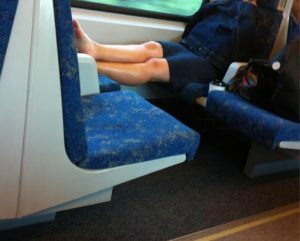 Even worse are people who take their shoes off and put their nasty, bare feet on the seats. Frankly, I think it’s disgusting and if I see anyone do it, I’ll be shooting them looks as dirty as their feet. You might not think that other people mind—but I sure as hell do, and I’m sure the other passengers who kept their shoes on and don’t want to be exposed to a stranger’s sweaty feet mind as well. Furthermore, the bus seats are probably soaked with other people’s farts, sweat, pee, and other unmentionable bodily fluids. You probably don’t want your bare feet on there, adding to the conglomeration of stench already circulating through the bus or train. Yet even if your feet are clean and smell like potpourri, I don’t think taking your shoes off in a public place should be acceptable. I think there are some social rules that should not be broken and taking your shoes and socks off in public is one of them. For one, no one wants to look at, much less smell, your dirty, stinky feet after you’ve been walking around probably sweating in your shoes all day. It’s just common courtesy. Also, the bus is a small, already smelly and confined space to be, so save everyone the extra, unnecessary odour and headache and keep your shoes and socks on until you get home. Is that so hard? You can let your feet air out at home, on a beach, or in a park, but if you’re in a confined public place, I would advise you to keep your shoes on. This social code is in place for a reason. Keep those dogs covered.